Hello, all! My very good friend Kim Wilson is hosting a fabulous challenge. Check out the inspiration photo above! The super sponsor: Practicing Creativity. You can find the prize and challenge details here. Used my new Wplus9 stamp set, Hooked On You (designed by Karrianne Gwin), to create this fun little card. Colored my fish with a few Copic markers, embellished him with a little glitter and attached him to a Hawaiian Shores cardstock panel. Then stamped the sentiment and heart bubbles in True Black. Created a few glittery waves (using Versamark, Heat & Stick Powder & Glitter) at the top of the Hawaiian Shores panel and wrapped with Summer Sunrise twill ribbon. Then attached it all to a white 3 1/2" X 5 1/2" card base. Super fun Maile! I love that little fish and what you did with the waves! What a wonderful card! I loev the glitterry water lines at the top and the simplicity of the rest is great. This is so cute. 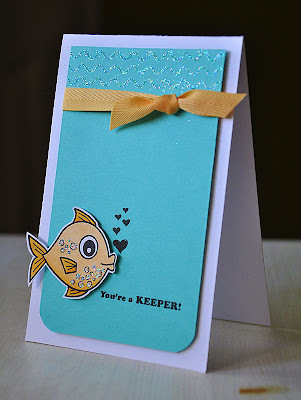 I just love the sparkly waves you created to go with that adorable fish image. Lovely Maile! 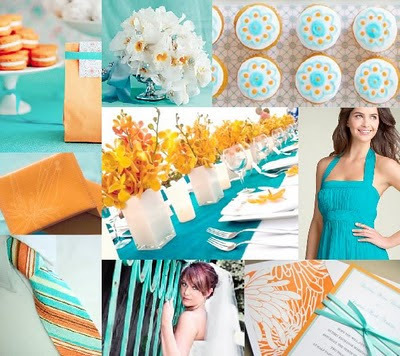 :) I am so excited to have you playing along, my inspiration board looks good here ha ha! Good luck!! 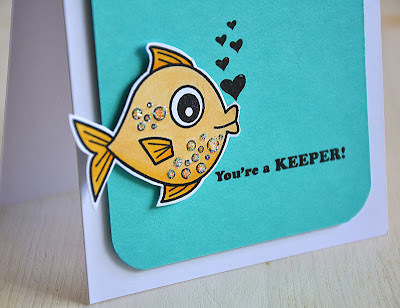 Very cute card - love the colour combo! This is so cute Maile! 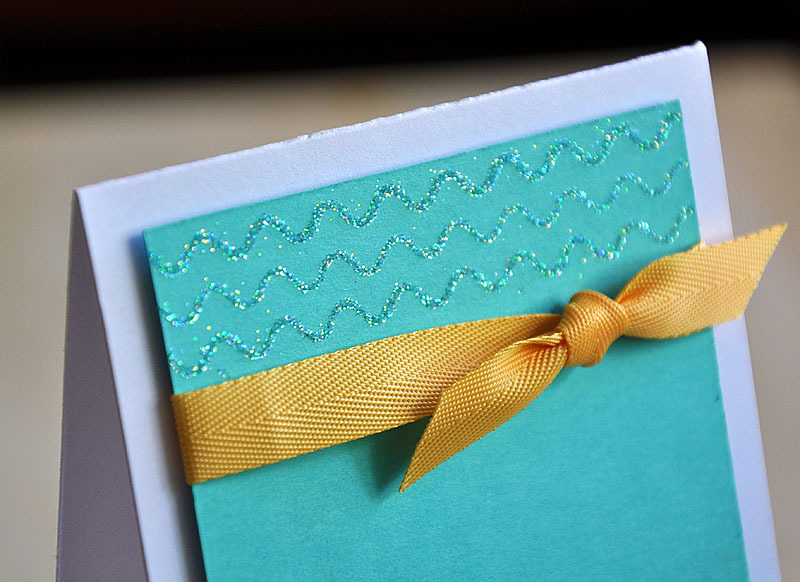 I love the colour combo and those glittered waves! 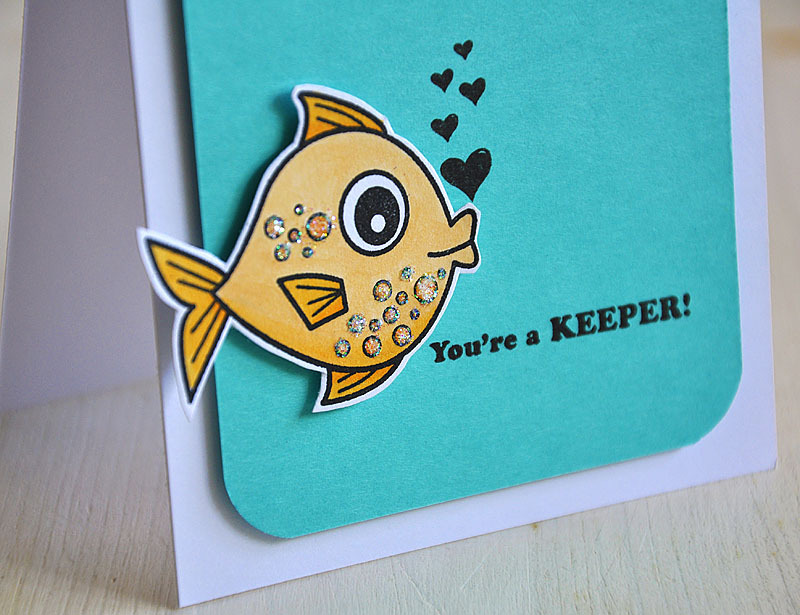 Your Hooked on You card is so cute I laughed out laugh.